I am afraid there is really not a lot to say on the background. If you have been following the tutorials then you have heard me say "focus on the lights and shadows" so much it is likely getting annoying. Also, if you have made it this far and you have successfully created a graphite likeness of Tanna, then the background should be a piece of cake. My only other advice to you is to rely on the tortillion. You should have built up enough graphite on it by now that you can use it quite well as a drawing tool. For instance, I blended the darkest areas of the background and then proceded to do then entire tie-died fabric with the tortillion alone. I never touched it with the pencil. If you have any questions, feel free to comment. If you run into any problems let me know. I am happy to do whatever I can to help. Just remember....you are never drawing objects. You only ever draw lights and shadows. Even when you are doing color, you are still working with lights and shadows. You are just giving them hues. That is it for this first series of lessons. I am not sure what I am going to do for the next one. I will let you know as soon as I come up with something. For that matter, if you have anything that you would like for me to cover, let me know. 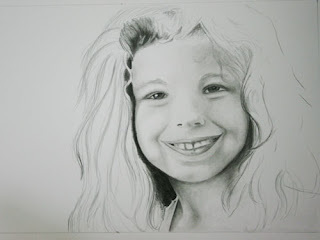 Now that you have gotten Tanna's face to look like you want it to look, you are ready to start on drawing the hair. But, if you are like me, you have a problem. You rest your hand on the paper while you are drawing and if you do that, you run the huge risk of damaging the work that you have done so far. The good news is that there is a solution. Take a clean white sheet of paper and lay it down on top of the area that you want to protect. Then you can lay your hand directly down on top of it. You still need to be aware of the area and be gentle with it, but you at least have a way to draw in comfort. Ok, now to get to the hair. 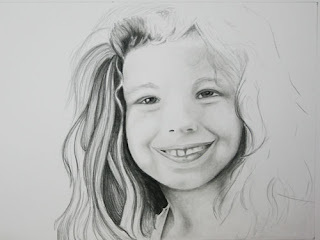 For years I have had people tell me that you do not draw hair, you simply draw shadows and lights to hint at hair. This is all fine and good. But it is my attempt to get as close to reality as I can. So, I actually draw each individual strand of hair. But don't worry, it goes faster than you might think. In the last lesson I said to draw in the direction that the hair is going. For most of Tanna's hair you will be drawing from the top down. However, she has a cute little flip in the front that will have you drawing from the bottom up. Here are tips to remember while drawing hair. Always draw in the direction of the hair. If you show where the hair meets the scalp you need to make sure that you "anchor" the hair to the scalp. The easiest way to do that is to make sure you are duplicating the shadows exactly as you see them. Draw one strand at a time. Layer the hair. Remember, hair is in layers, so it makes sense to layer your drawing. Draw light lines and build them up on top of each other. If you need to make highlights in hair that you have already drawn, you can use a sharpened click eraser or an electric eraser. Below are a couple of images that show my progression on creating the hair. Finish up the rest of the hair on this image. 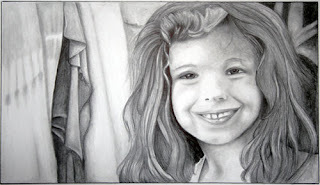 In the next lesson we will discuss the background and likely finish the portrait. For a while now I have been considering experimenting with pastels. I have debated back and forth if I wanted to try working with oil pastels or soft pastels. I used to work exclusively in oil paints so I was tempted to go that direction with the pastels. However, I do live in a small motorhome and after researching oil pastels I learned that they never actually dry, like oil paints do. So, keeping them from damage is actually impossible, I am can not frame and hang the finished work. So, I settled on soft pastels. I was still not convinced of what I might be able to accomplish with them, so I was not willing to spend a lot of money up front. We went to Michael's on Saturday and I picked up a really cheap set. $5 for 48 colors. I don't think these could even be considered student line, let alone high quality. Anyway, I got them out this afternoon along with a really cheap pad of paper that I picked up for doing quick sketches and sketched out an eye. I have always been very unsure about skin tones until I read a really intersting formula this morning. 2 warm colors + 1 cool color + gray = skin tones. I decided to try it out. I used a dark gray to lay down the initial sketch, then use a light brown (this color containing both a warm and a cool color) then I layed a light pink on top. I liked it ok, but it seemed a little dull, so I tossed in a bright yellow and some bright white in the highlighted areas. I must say, I was rather pleased. I only spent 5 minutes on this and the results are rather satisfying for that amount of time. 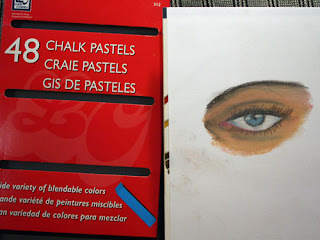 I think I am going to use these pastels for our Virtual Sketch Date this month. If it come out OK, then I will go ahead and invest in a higher quailty set. Here is a photograph of the sketch along with the package that the pastels came in. 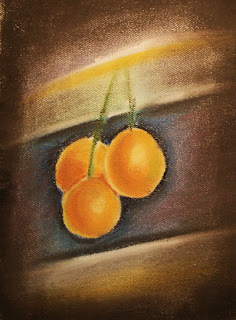 If anyone has any comments or advise on using pastels, I welcome them. I suspect I am going to enjoy working with this medium. At each step in the process of creating a portrait, I tend to spend a lot of time simply looking at what I have drawn and comparing it to the original image. When I got to this point in the drawing I realized that I had made several mistakes. I have pointed them out with red arrows in the image below. The first area is around her right eye. I did not include the shading that gave dimension to the face. The result was that her head was looking a lot wider than it really is. The next problem was the shape of the cheek. It was subtle, but I did not made the cheek quite wide enough. I had to actually erase the line of the cheek and rework it. Be careful when erasing. 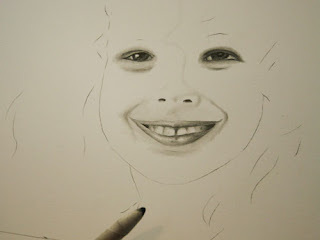 use light gentle strokes with the eraser until you have removed enough of the graphite. You do not want to remove any paper or you will have a LOT of trouble getting it to look nice and smooth when you go back to it. Now we start getting to a couple of the bigger mistakes. The area of the right cheek, just below her dimple was way too smooth. If you look at the original image you will see that there is a lot more chubbiness in the cheeks than what I created. This required me to remove a great deal of graphite that made up that area. Once I did that, it gave the cheek more definition and brightened her smile. That same problem showed up on the other side of her face as now. The biggest problem though, was the are between her lower lip and her chin. I actually turned the shadows the wrong way. This took a great deal of erasing and reblending to correct. The result of the mistakes that I had been making was causing the portrait to look like a much older child than Tanna really is. There are actually a couple of other mistakes, but I didn't notice them until much later. Below is a copy of the original so that you can compare and see exactly what I am talking about. After making the corrections I was able to continue on with the drawing.I decided to move down and finish all of the skin tone areas. It is very important to get the neck to look right. As always, focus on the shadows and recreate them. Make sure that you do not create a line around the chin. Many people spend a lot of time on the face and leave the neck as an afterthought. The result is always what I call "Talking Heads." It looks like a face floating in air. In order to keep a portrait looking like a professional portrait you have to consider the neck to be just as important as the rest of the face. It is a continuation of the face and creates an anchor for the entire image. 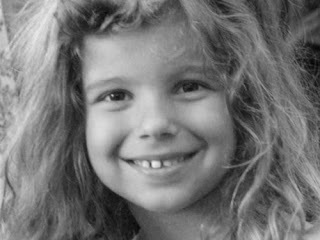 Then, by creating the rich dark areas to frame the face, we are starting to get an image that actually looks like a beautiful young girl. 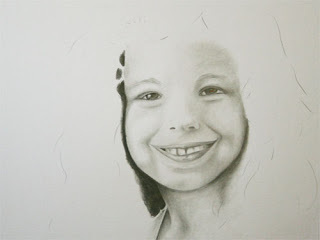 Before considering this stage of the portrait finished I decided to throw in the basic lines of the hair. When doing this, pay close attention to the various waves and nuances that make up shape of the hair. At this point, you are not trying to create the hair, but simply lay in the shape. These shapes will be your guidelines when working with the rest of the hair. Tip: When drawing hair you should always move your pencil in the same direction that the hair is flowing. In other words, from inside out, or from top to bottom. In our next lesson we will focus entirely on the hair and what you need to do to make it look as real as possible. Since it has been a while since I was able to update the tutorial I am going to cover a lot of ground in this post. 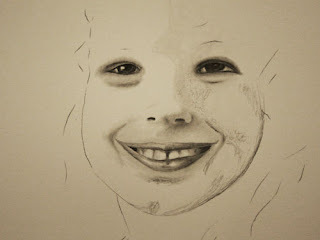 I will start with fleshing out the area around the mouth. Then we will add some blocks of shade to the face and finally blend it all together. By that time, your image should start to actually look like a real face. So, without further ado, let's get started. If you have been using the tortillion to blend your graphite you should have a pretty good build up of graphite on the end. The image below shows the tortillion that am using and the build up of graphite. This is where one of the secrets of this method comes into play. You can actually use the "dirty" tortillion to draw with. Using the tortillion, start to lay in the areas of darkness in the creases of the cheeks. Keep your reference photo handy and refer to it constantly. Looking quickly back and forth between the reference and your drawing will help you see where you need to spend more time to produce darker areas. Note: If you do not have enough graphite on the tortillion, you can lay down a bit more with the pencil. However, it is important that you do not press down with the pencil. 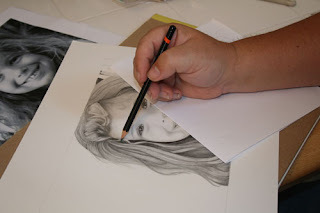 Let the weight of the pencil to all of the work and lay the graphite in small circles or short strokes. Once you get the area around the mouth worked out, move to the nostrils. Using a pencil, put in the dark areas inside the nose. Then use the tortillion to bring out the shadows that give form to the nose. Finally, using the tortillion, create the line that separates the lighted side of the face from the shadowed side. Remember that in all of this, you are not drawing objects. You are not drawing a nose and cheeks. All you are doing is reproducing the light and shadow areas. Focus on that, and forget that what you are working on is a facial feature. 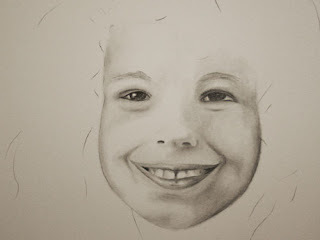 The next step is to lay down the blocks of shadow that define the rest of the face. Like we did above, do not draw these areas. Instead, just lay the pencil on the paper and let the weight of the pencil do all of the work. If you need more graphite in a given area, do not press harder, simply go over the area until enough graphite has been layered in to work with. Now that you have the graphite on the paper, pick up the tortillion again and begin to blend. 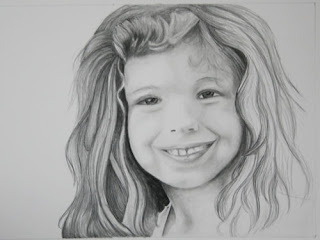 Work the graphite until you no longer see any of the pencil lines. You want all of the dark to light areas to be a gradual change. All you have to do is keep looking at your original and reproduce the lights and darks exactly as you see them. Once you have the blending done, you should put in the eyebrows. Do this with a very sharp pencil. Use a light hatching stroke going in the same direction as the eyebrow hair. Remember that hair is not exact. Each strand of hair is its own length and thickness. If you do not have much practice in drawing hair, I recommend that you get a scrap piece of paper and practice until you get the results that you are looking for. In our next lesson we will focus on the neck and I will show you where I made some of my mistakes and how I fixed them.